Did your ancestor serve on the local council? My grandmother was quite proud of her family, and when I started researching them I could see why. Both her grandfathers paid their own way here, and both made something of themselves once they arrived. 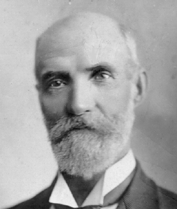 Peter Hannah Stewart arrived during the Victorian Gold Rush, although that didn’t occur to me when I first found this out, as he had settled and died in Albury, on the New South Wales side of the border with Victoria. I had found all the usual records that are now becoming more accessible – directories, electoral rolls, the birth registrations of all his children, and so on, and I thought I knew a bit about how he lived and what his life was like. This obituary in the Albury Banner and Wodonga Express on Friday 17 February 1911 told me little I didn’t already know, except that he represented Indigo Riding in the Yackandandah Shire Council. This was news to me! Peter was declared insolvent in May 1881 at the Beechworth Courthouse. He claimed that the causes were ‘bad crops, want of employment for machine, and pressure of creditors’. He appears to have sold up and moved to Albury, New South Wales, around this time. I suspect that his insolvency and move to Albury put an end to his Council adventures, but he involved himself in public life in other ways, in the local Presbyterian Church and the IOGT – the International Order of Good Templars. The Good Templars was, and still is, a temperance organisation promoting moderation or total abstinence in alcohol consumption. They no longer appear to be active in Australia but I imagine that their influence lived on in their descendants. My grandmother wouldn’t have had a drink to save her life. The next step is to examine the records of the Yackandandah Shire Council, if they still exist – minutes of meetings, decisions taken, and so on. That will have to wait for another day. 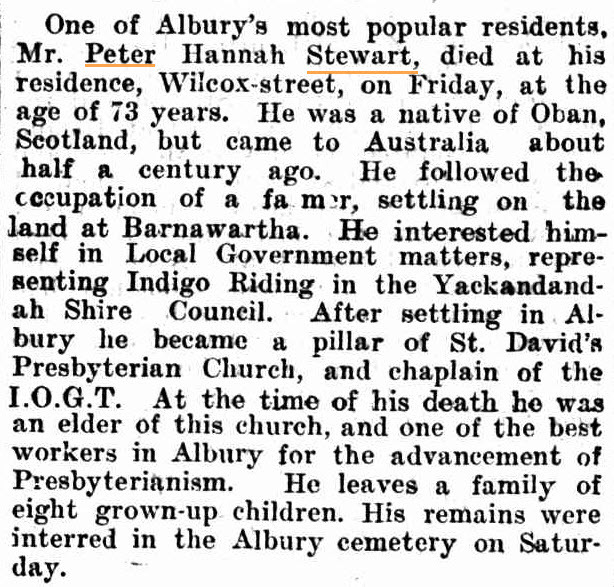 National Library of Australia, Albury Banner and Wodonga Express, Friday 17 February 1911, p.31, ‘Personal’, obituary of Peter Hannah Stewart, accessed on Trove, 23 July 2013. National Library of Australia, The Argus, Friday 6 May 1881, p.5, ‘New insolvents’, Peter Hannah Stewart, accessed on Trove, 16 May 2012. Victoria Government Gazette, 1881, p.1243, ‘Insolvency Notices’, Peter Stewart.